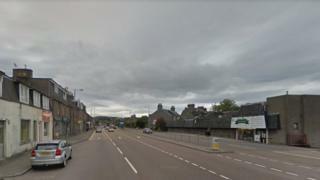 Police are searching for a driver who drove off after a car struck a three-year-old girl in the Bucksburn area of Aberdeen. The collision took place at about 12:30 on the city-bound carriageway of Auchmill Road, near Chalmers bakery. Officers said the driver stopped initially but then drove away in the direction of the Haudagain roundabout. They want to speak to anyone who may have seen the collision or the car - a grey Suzuki Alto - and the driver. The girl has been treated for minor injuries at Aberdeen Royal Infirmary. Sgt Steve Manson said: "The three-year-old girl was crossing the road within the area of the pedestrian crossing with her mother when she was struck by a city-bound vehicle. She was taken to Aberdeen Royal Infirmary for treatment for minor injuries. "Following CCTV inquiries the vehicle has been identified as a five-door grey Suzuki Alto. "The driver of the vehicle appears to have been aware of the collision and stopped a short distance away, before driving off, in the direction of the Haudagain roundabout." He added: "We are also looking for anyone who was on the A96 around or on Auchmill Road, Aberdeen, around the time of the collision and may have dashcam footage to also contact us."